Oblique holders: what are they, why use them, and where to buy them? This is an oblique penholder, or most of one. The important bit here is the brass flange that holds the nib at an offset angle to the paper. And the reason behind it is: science. Well, physics, mostly. Nibs used in pointed pen calligraphy are, as the name might suggest, very pointy. Effectively, you’re dragging two sharp points down a piece of paper, and the ink is creating a film between them that makes your pen stroke wider or narrower, depending on how much pressure you use (and therefore how far apart the two points of the nib – the tines – are). Does that make sense? Here is a short video of me writing, sped up about twelve times, that might help. It would probably help more if it were a little slower, but I think you’ll get the idea. So, the pressure you put on the nib determines the width of your stroke. But if you’re putting heavy pressure on a very sharp nib, you can only drag the nib in one direction – downwards. You just plain can’t push it upwards while you’re putting pressure on it – imagine pushing the tip of a push-pin into a sheet of paper, and then trying to drag it upwards. Doesn’t work. You can drag it slightly sideways, though. But if you do that, one of the two tines will be gliding smoothly, and one will hop and skip and scritch, and you’ll wind up with one smooth side and one jagged side of the stroke. You’ve got to be pulling the nib so that pressure is even on both tines. Figure 1 in the link here illustrates what I mean – thanks, Dr Joe! But – copperplate is written usually at around a 55° slant angle. So you actually need to drag the nib sideways-ish to get that. 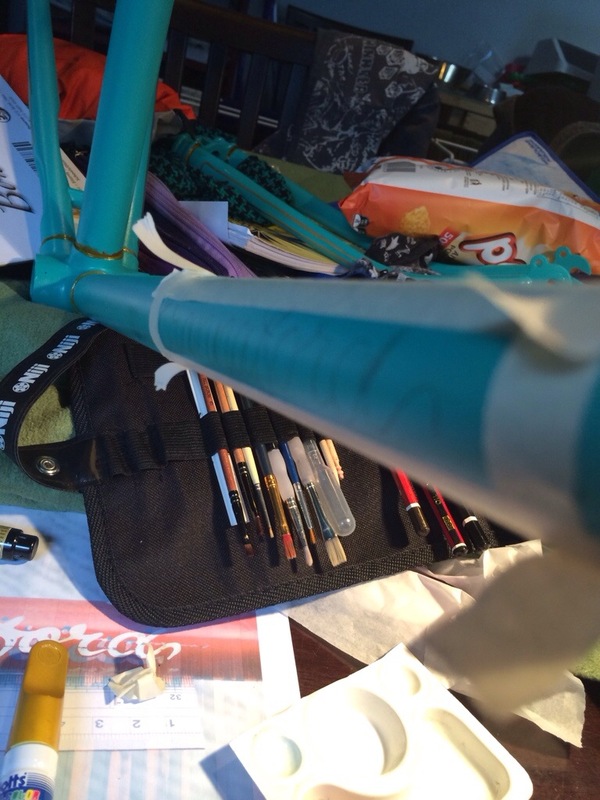 This is where the oblique penholder comes in. It is built to hold the nib at a much steeper angle, so that you can write like a normal human being instead of having to move your right arm way across to the left of your paper and then try to turn your elbow inside out just to get that elusive slant. A note: there are some extremely talented calligraphers who don’t think it’s necessary at all. 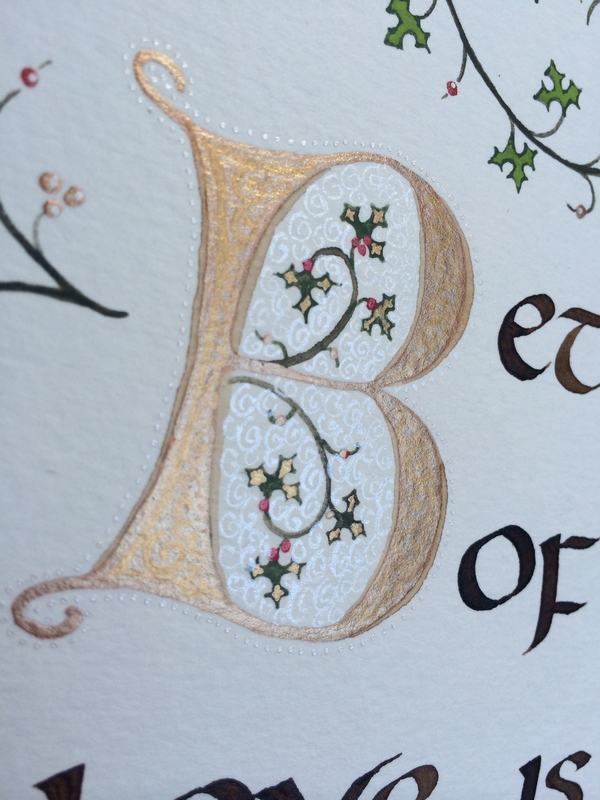 There are some extremely talented calligraphers who do. Threads about this can get pretty hot. For my part, I’m definitely on Team Oblique; I acknowledge you can get just as good results without it, but it will be a lot more difficult. And who’s got time for unnecessary pain? Alert: if you’re a leftie, you probably do NOT need one. Lefties are already coming at the paper from basically the perfect slant angle, no twisting required. You can purchase a left-handed oblique but I wouldn’t do that until you’ve tried a straight pen and worked out whether you actually need one – ie, whether the angle is uncomfortable for you personally or not. So … if you do want one … where to get them? The short answer is: with the current popularity of calligraphy, it’s getting pretty tricky. For something that was obscure and difficult to find ten years ago, they have really taken off. 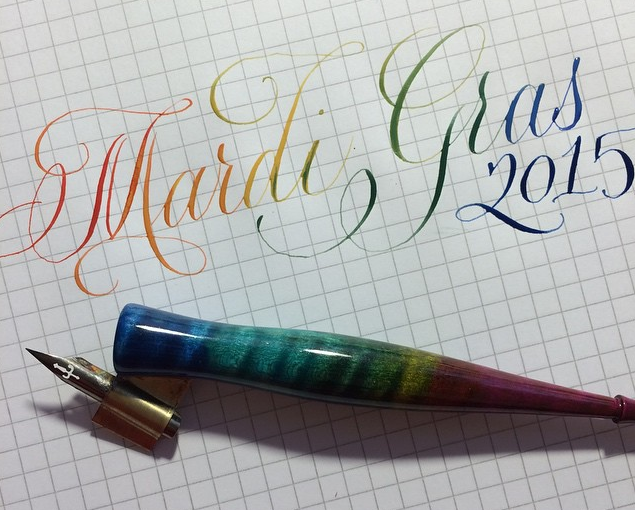 Custom oblique penmaker Brian Smith of Unique Obliques usually posts five to eight pens in his Etsy at a time, a few times a week; invariably they sell out within sixty seconds of posting. Sixty SECONDS! However, you can still usually get a non-custom one from either of my two favourite online retailers: Paper Ink Arts, or John Neal Bookseller. – a slightly thicker grip, if you’re planning on writing with it a lot (like, say, for calligraphy practice, oh wait that’s all of us). The narrower the pen, the less comfortable it’s likely to be for long periods of time. – a flange that fits your preferred nib. If you don’t have a preferred nib, then a flange that fits a wide variety of nibs so you can work out what your preferred nib is. The flange on the Hourglass Adjustable Oblique (and the same one on the PIA Adjustable Oblique Holder, although the grip on the PIA Adjustable is quite narrow) will fit anything up to and including a crowquill, but can be tricky to adjust if your nib isn’t sitting quite right in it. The simpler flanges on the Century holders will fit many nibs by default and every nib if you take a pair of round-nose pliers to them – except a crowquill. – personal preference here: a slanted foot. (The “foot” of the penholder is the part closest to the paper, from which springs the flange.) If it has been cut at an angle, it’s a lot easier to dip your pen in a wide-mouth – or a narrow-mouth – jar of ink without getting splashes from here to there; it takes a small amount of weight off; and I just plain like the look of it more. The holder in my picture above doesn’t have a slanted foot, and is still one of my favourites (it’s rainbow! and so light! made by Heather and Chris Held!) but this one, custom-made for me by Luis, does (and it’s one of my favourites! it’s glossy! and so light!). – something you love. I get unreasonably attached to my holders. Like the Luis penholder linked in the slanted-foot paragraph above. 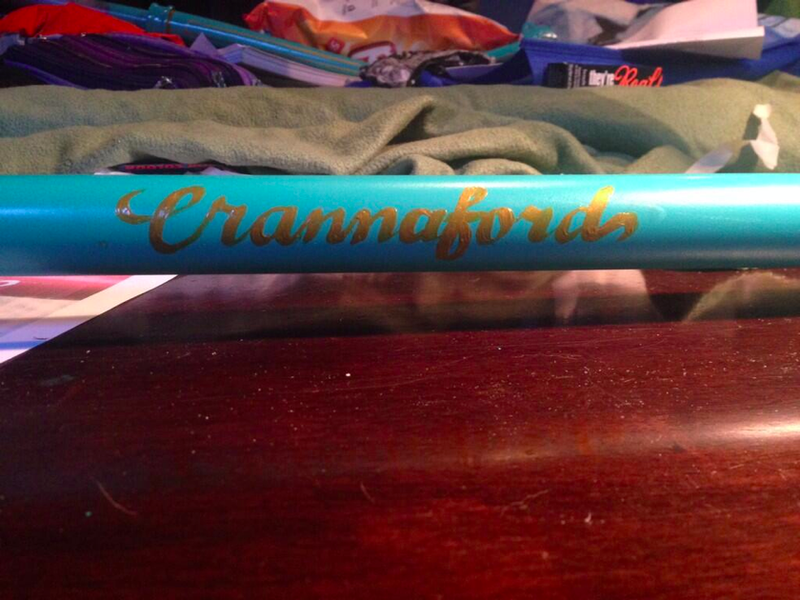 Tell me that isn’t the most beautiful pen you ever saw, I dare you. Or my Ashley Bush Ink holder – twice the size, much thicker grip, super comfortable on those sore-wrist days, came with a spare flange for smaller and for larger nibs, complete with the greatest customer service I’ve ever had the pleasure of dealing with (Ash is just a delight!). Or my Jake Weidmann penholder, adjusted for me by Jake at a workshop, a bit heavier and stronger and writes like a dream. Or … I guess what I’m saying here is I get perfectly reasonably attached to my tools. They’re functional, yes, but they’re also pieces of art. Creating art with art made for you by another artist – what’s better than that? And finally: how many holders do you need? Look … probably just one. But that depends on your definition of need. Ted Baker and onsite calligraphy! So, usually I’m quite cagey online about my client work; I won’t post anything to social media until after the event or relevant date has passed, and even then only with the permission of the client. It’s just better that way; why risk accidentally spoiling the surprise for a first-anniversary-present, or accidentally announcing to the internet that such-and-such will be at x place at y time and their home will be empty? The odds of anything terrible happening are astronomically low, but I’d rather be safe than sorry. However, this particular client said “Yes, please!” to social media, and I’m having a heap of fun doing the work, so I’m pretty excited to share this! 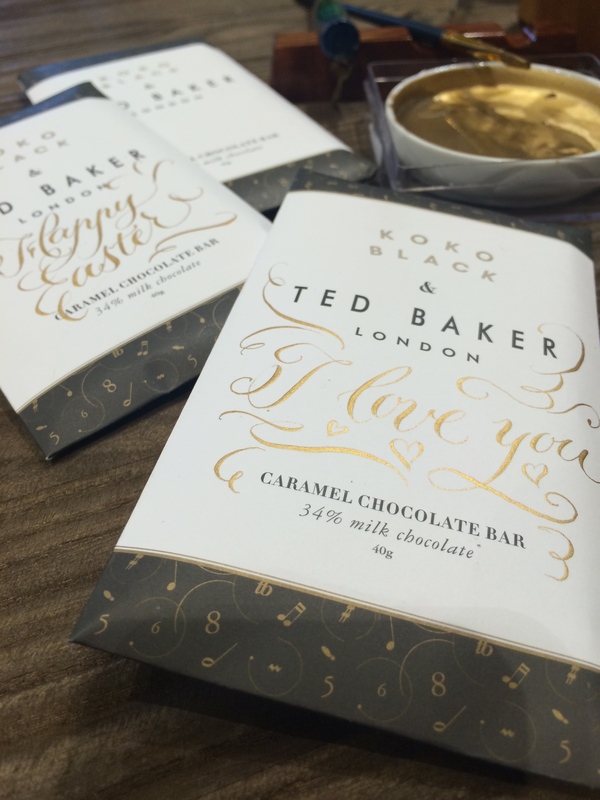 Ted Baker London has teamed up with Koko Black to create a signature caramel chocolate bar for the brand, and while the promotion is running they have calligraphers in-store to personalise each chocolate for eligible customers. What that means is: some seriously fancy chocolates. There are a few challenges inherent in writing on wrapped chocolate bars. For one, pointed pen calligraphy relies on pressure and release, and you can imagine it’s a bit tricky to wield a sharp pointed nib against a chocolate bar! Another: it’s not remotely a flat, smooth surface to work on; it’s hard enough using an ordinary pen on something lumpy, let alone a flex nib. I asked Ted to send me a sample beforehand so that I could work out my options, and they very kindly did so. I had been thinking that brush pen was the only way to go, and laid in a few extra Zig Stella pens with that in mind. But when the sample arrived, it turned out that the paper is juuuuust smooth enough to make it work if I use a very flexible nib, go very slowly, and keep a very steady hand. I ended up bringing the brush pens just in case, but as you can see in the picture, I’m managing a loose modern copperplate over the chocolate without much trouble. I’m using a Japanese gold sumi ink (this one, with added gum arabic as a binder) which gives a slightly raised effect and doesn’t take very long to dry. And it’s all working very well. The staff at Ted Baker are absolutely delightful and everyone’s fascinated by my oblique penholder – I’ve been asked a lot of questions about it. I’m having a fantastic time, and I’m looking forward to the next two sittings next weekend. I really hope the trend for onsite calligraphy catches on in Melbourne – I’d love to do more of this! 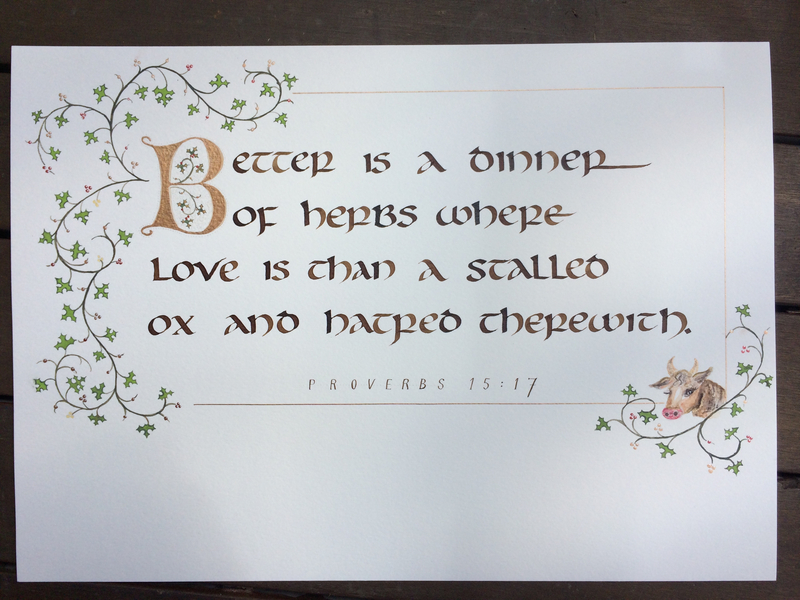 Donald Jackson is one of my Big Calligraphy Heroes – that man is an inspiration. This video is one that my first calligraphy teacher showed us, way back in Calligraphy 101. I remember that class being after I had stayed up all night working on my portfolio for the semester, so I was a liiiiittle bit sleepy, but I was still really into this movie! The first two parts are here: Alphabet: The Story of Writing, parts 1 and 2. Part 1 is about the origin of the alphabet, up to and including the Roman Empire. Part 2 starts with illuminated manuscripts and Carolingian, and includes some really useful information about how to prepare and cut your own quill pens. Quills are amazing to write with, but don’t let the great DJ fool you – they’re really hard to cut, if you’re not used to it! And at the end, the section on illumination is also really useful. I work with gold leaf as often as I get the chance to, and although I’ve read about one million books, it’s the images from this movie that stuck with me the most. Also … it’s just beautiful to watch. Part 3 starts of going further into the process of illumination, including how to remove mistakes – and how to spot them in medieval manuscripts. Pretty cool. Then a quick diversion to the development of Gothic and of Italic before reaching (dun dun DUNN) the invention of the printing press. And of engraving; all my etiquette books even from the 1950s talk about engraving wedding invitations, and this movie is a really cool look at how it’s done. I wish I had an engraver and a print shop at my command! Part 4 is about the rise of the steel pen and the fountain pen, definitely interesting to the modern calligrapher. This movie was made in 1980 … so it’s a little older than I am. But it’s not like calligraphy techniques have changed in thirty years, not enormously. I use a more modern version of gesso which is a little more forgiving of humidity and a lot easier to acquire (I just buy it in jars, no lead, plaster and fish glue for me!) and I totally blame that for my gilding not turning out like Donald Jackson’s. It’s absolutely the medium, right? Not the skill of the gilder at all … nope, couldn’t be. A calligraphy emergency could strike ANYWHERE. Be prepared! 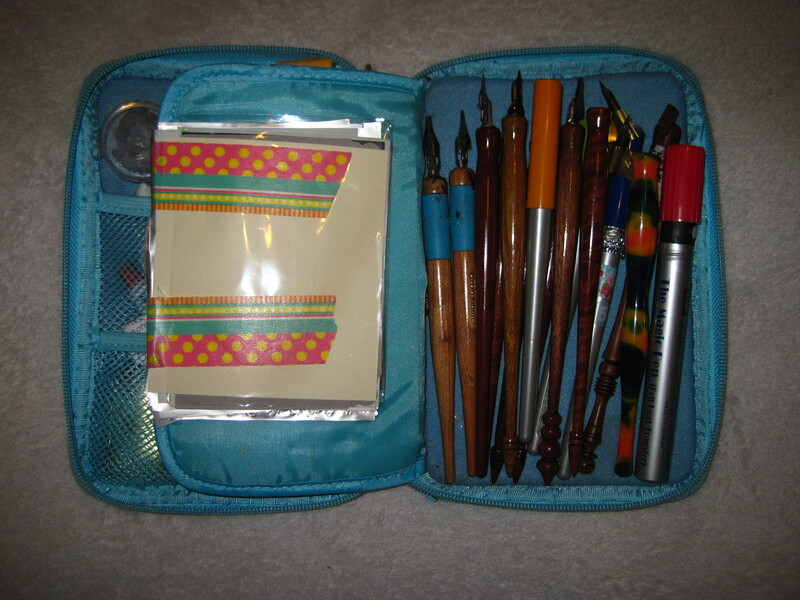 I’m not saying I pack my calligraphy travel kit before I pack my clothes when I’m going away … but I’m not not saying it. I think my priorities are perfectly in order, don’t you? Anyway, there was some recent discussion of what we take with us when we travel and how, so, here it is – the kit I take with me whenever I’m likely to have some downtime in a pleasant place. It miiiight be a little excessive, but I stand by my decisions. Here we go. The blue bag is a rubbish little thing I bought years ago from a kid’s stationery store (Smiggle, if you have those over there!) but it’s actually the perfect size and shape and I love it. I haven’t found anything better to upgrade to in all that time. My three most-frequently-used Parallel Pens: 4.5mm (specially cut down), 3.8mm and 2.4mm. I have the 6mm and the 1.5mm also but I don’t use them anywhere near as often (and I don’t really like the 1.5mm; there’s not much difference between thicks and thins. If I’m working that small I just use a William Mitchell nib). For travelling I wash the barrels out (thoroughly!) and load them with cartridges. At home I’ll sometimes eyedropper-fill them with whatever ink I prefer at the moment, but I don’t trust the barrel seal in an aeroplane. Broad pens – I don’t like forever taking nibs in and out, especially if I’m working with a few different sizes at once, so it just makes sense to have a bunch, right? I think I have here most of the Speedball C-series and one lonely William Mitchell. Two empty holders, one oblique and one straight. Just in case. 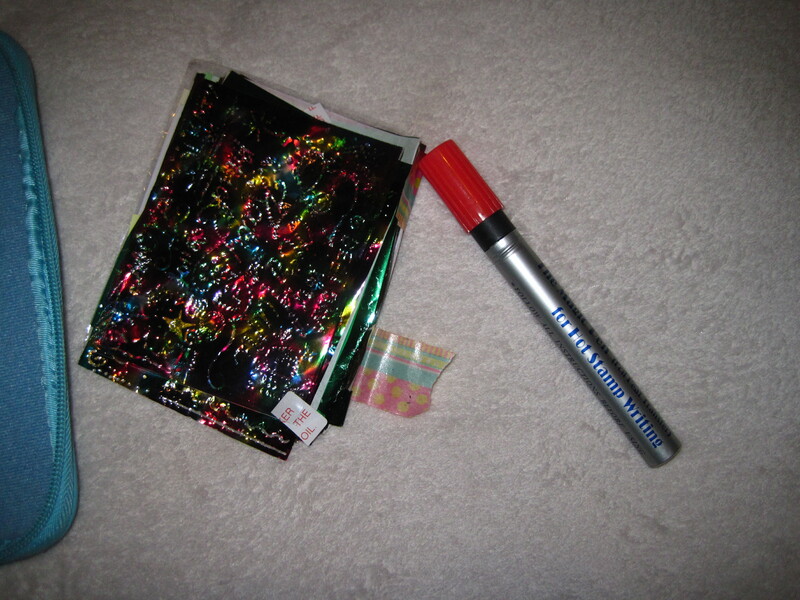 Finally, my hot foil pen and a packet of foils! This is my favourite new toy and I’ll have to do a review post on it soon, since there’s not much information out there. It’s not really gilding and it’s not really writing with gold, but it’s definitely the closest thing to gilding you can manage in a travel kit – and it’s an awful lot of fun. That’s a rainbow foil on the top, but there’s blue, red, green, silver and gold in the package, too – so many options! I cram a lot into a small space. Let’s see. So, an assortment of stirring sticks and spoons (I like those little airplane spoons and always try to save them! ); an assortment of brushes. Mostly 1, 0, and 00 watercolour brushes of varying grades, for painting and mixing, although I can see I’ve got one long one in there for brush lettering. No flat brushes this time, oddly. A pipette – always useful. More specialised tools next. My ruling pen – just a very cheap eBay one, but it’s more useful than i would have thought. I like lettering with it; I LOVE ruling with it. For some reason I never realised how useful it could be to have an adjustable-width monoline pen you can fill with any kind of paint or ink and rule a perfectly straight line with! Speaking of which: my fluid writer. It’s a monoline pen you can fill with any kind of paint or ink … but you can draw with it rather than rule straight lines. It’s also incredibly useful for adding tiny dots – handy when illuminating capitals or decorating acanthus leaves. An automatic pen (number 3.5, I think?) I don’t know why I love it so much, but I just do. It’s a lot more forgiving and flexible than a parallel pen, and you can really load it with anything – including masking fluid or gold size – and still get a perfect line. 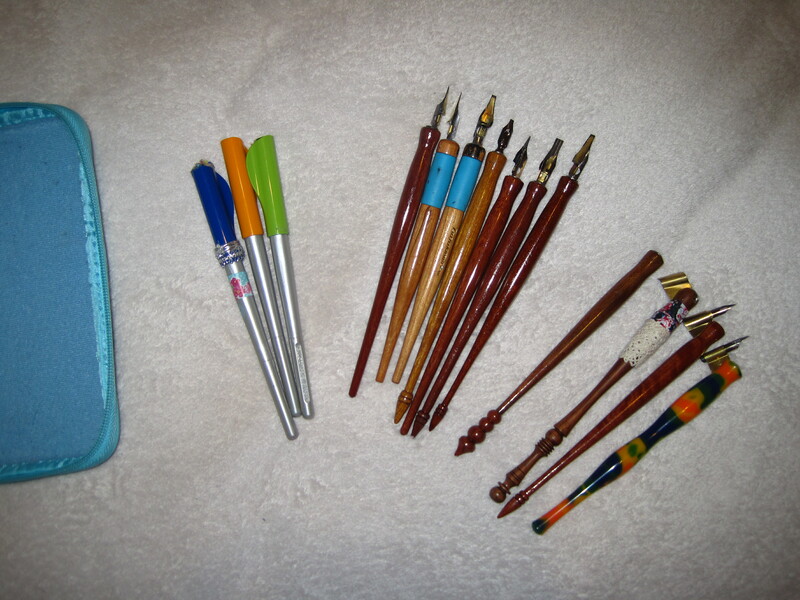 An automatic pencil – always need a pencil! One 0.01 micron pen and two Copic fineliners (0.05 and 0.01, I think). Finetec gold. You ALWAYS need gold. This is just a refill pan, which you can get separately – much more portable! It’s sitting on top of a couple of sheets of blotting paper. Next to that, in the plastic tub, a kneaded eraser. Next to that, another little tub full of walnut crystals – these are my favourite ink to travel with, because you just add a sprinkle of these to a tiny bit of water at the other end! Next, a package of mixed-colour Parallel Pen refills. I don’t think much of the ink and it has a tendency to feather on nearly everything, but it’s great for layout work and the colour-changing is just plain fun. Two little empty tubs, for ink. I’ve found about a quarter of an aeroplane-spoon of walnut crystals is the right amount for a tub this tiny, and I’m not likely to use much more than that unless I’m doing something serious. 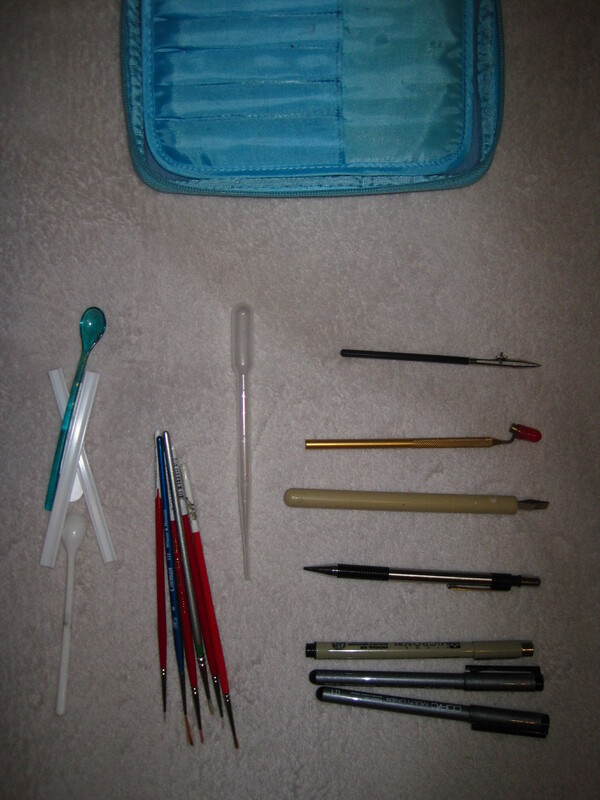 A travel toothbrush (with a few blunter pointed nibs shoved in the case for off-hand flourishing practice) for cleaning nibs after use; a tiny travel toothpaste for cleaning nibs before use. I’m not really sure why there’s two toothpastes in there at the moment. Maybe, like bobby pins, they breed in the dark? Maybe there’ll be three next time I open it! Blu-tac – blu-tac that I mostly use to plant my tiny plastic tubs of ink into, to make sure I don’t knock them over with a casual flying hand because they’re so little and light. And that last pink thing is a tiny magnifying glass the size of a credit card. 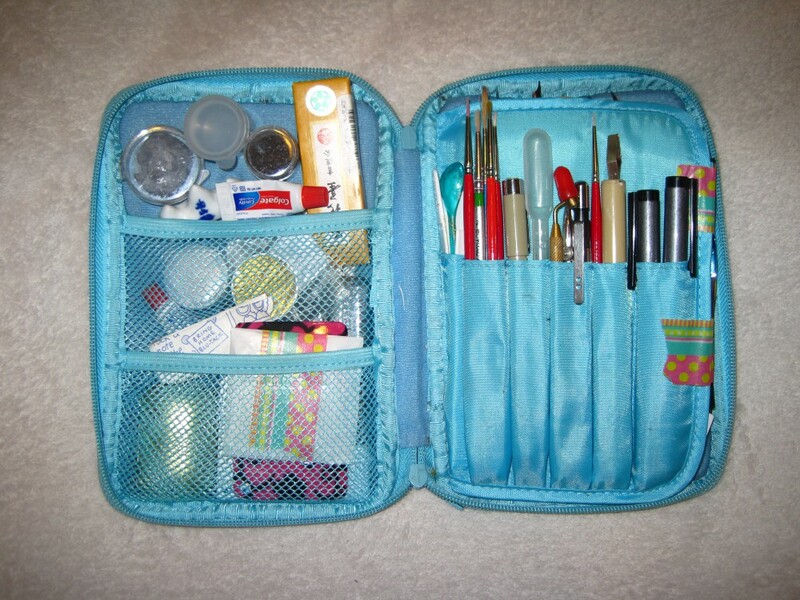 It all packs up very neatly into the little blue case, which goes in my handbag. I’ve only ever once had airport security ask questions – they just looked through it curiously before putting it back in. Of course a scalpel and a craft knife are not part of the kit when I’m flying! When I’m taking it to and from local workshops, I slip those in, but so far I’ve always remembered to take them out before flying. The other thing that’s usually in there and isn’t today (not sure why) is a carpenter’s pencil – the flat type. Those are great for practicing, because you can sharpen them to any width you like, and you can practice anywhere with a pencil. I’ll have to remember to put them back in. 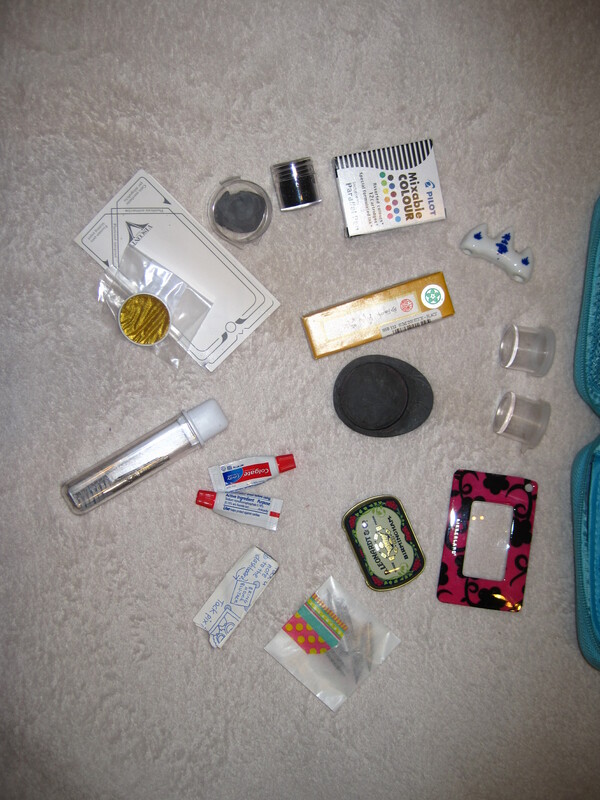 And that has been my travel kit. 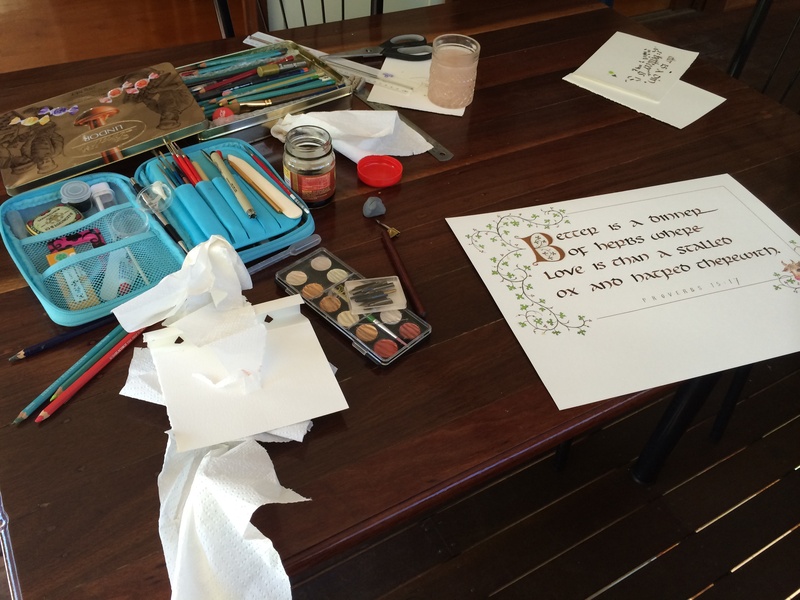 I have to take it with me – can you imagine if someone needed calligraphy and – gasp! – I didn’t have my kit? A calligraphy emergency can strike at any time, kids! You need to be careful! You know, I like to tell people that you don’t need anything special to learn calligraphy except for a nib, a holder and some ink. And then I look at the amount of Calligraphy Stuff I seem to have amassed, and I suspect that I might be a little mistaken about that first part. Just a touch. I really should work out a better way to photograph lettering. I think that half the joy of calligraphy is the texture of the paper, the shine of the ink – things that can’t be reproduced (or at least, not easily) by digital art or even prints. The above ‘Congratulations’ is a pale gold (the Finetec, again, from John Neal Booksellers – I just really love it) on a smooth black card. The lettering style is a modern version of copperplate with a bit more bounce and movement. I tend to struggle with modern pointed pen because it’s so much freer than the traditional forms – and I’ve never been particularly good at improvisation. Not that I’m particularly good when I’m following the rules, but when there are rules, it’s much easier to know how to fix it. When all you can come up with is “that just seems wrong, somehow …” things get tricky. So, of course, I took a class today* on contemporary pointed pen, and on how to break the rules. Margaret taught us several excellent scripts, all of which I imagine you will see in upcoming posts as I work my way through them. This second picture is a pointed pen Italic script that’s quite condensed and has some really cute touches – I think it could be really useful on invitations in particular. Another weapon to add to my arsenal! Some blots and smears you just can’t repair. Erin did not get her birthday card! Off to a workshop today – see you on the other side! I’ve done some lettering on drinking glasses before, and I painted Christmas baubles last year, but this was a first for me: a bike frame! Masking tape and pencil: so useful! Danni is a bike mechanic, and she has a project – Mackenzie. 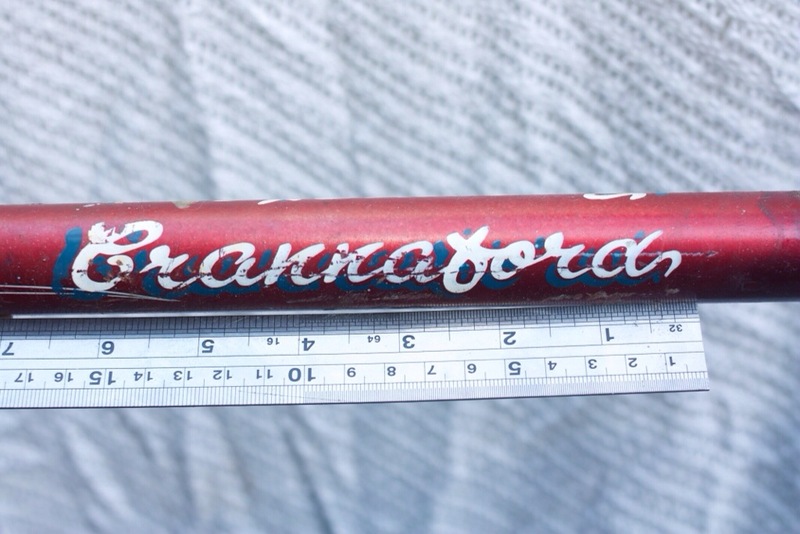 Mackenzie is a Crannaford bike, which is an Australian make that is no longer, er, made. Danni asked me to do the lettering, guiding me to keep the spirit of the original logo, but not to sweat the small details – which I was glad of, since I don’t have any kind of lettering or design training, only calligraphy! I was actually quite nervous about this one. Lettering on a curved surface is always difficult, to start with. I’ve also never worked with enamel before, so I wasn’t sure how it was going to flow and to what extent I’d be able to keep my letters looking like letters… and of course, it’s not so easy to throw out a vintage bike and start over as it is a sheet of watercolour paper. So I spent a lot of time measuring and planning before I dared touch it with the paint. I needed to write it twice – once on each side of the frame – and I needed it to be the same size and in the same place on each side, obviously, and I certainly wasn’t about to employ my usual approach of “let’s just wing it and see” on someone else’s project. This is what the original logo looked like – thanks to Danni for the picture! As you can sort of tell from the result, I ended up using quite goopy enamel. I did consider putting thinner in it, but we weren’t sure if the thinner Danni had would work with that paint – and I also wasn’t sure that it would produce a decent result, since the enamel was already quite transparent. We were already wondering if gold on aqua would stand out enough. I used a small flat brush (necessitating a little bit of messing about to transfer the enamel from the container it came in, which already had a brush, similar to a bottle of nail polish) and then an 00 watercolour brush to try to tidy up the edges, wherever the gold went ragged. It took quite a long time, although I think it would go faster next time, now that I have more than zero experience with it. The aesthetic Danni was after included brush strokes, so I didn’t have to worry about a perfectly smooth result – which is lucky, as I don’t know how I’d have achieved that. A holiday afternoon project: a dinner of herbs and love. I stayed with my family in Brisbane for a few days this month, and had an afternoon free; and my mum had some lovely watercolour paper that really needed some attention. We had had a conversation or two earlier in which this bible verse came up, so it was kicking about in the back of my mind. Did you know a “stalled ox” is a fairly rough equivalent to, say, wagyu or kobe beef? Kept in the stall and fattened specifically to be delicious. Very straightforward! But you just can’t go past a bit of hatred and a therewith. Now I mostly avoid the risk by travelling with dry inks only – walnut crystals and a stick of Korean sumi (that I bought in Kansas, of all places). Walnut ink gives that lovely dappled effect. You can make it more consistent by, for example, dipping your pen at the start of every letter, or even every stroke; I dipped only every few letters, because I like that light-and-dark effect. I used a Speedball C-series for the uncials and an Esterbrook 358, I think, for the small capitals. The trailing ivy leaves are done with four or five shades of watercolour pencils, borrowed from my very tolerant mother. I used an 00 watercolour brush and treated the pencil tips as a palette rather than use the pencils directly, because I needed a very fine line that I couldn’t get with pencil. Finally, the gold (and, although you can’t see much of it, the silver and metallic red highlights) are Finetec pigments, which I love and will use whenever I can find an excuse because they’re just fun. I can take no credit for the ox; that is my mum’s work. She’s very talented with watercolour pencils! I love its little eyelashes and the innocent way it’s peeking out. Poor ox. It looks so happy. I hope nobody tells it what’s about to happen to it. Of course, looking at this piece a month later, I can see many things I would have done differently and better, but also quite a few that I like and will repeat. I guess that’s how it goes – everything is a learning experience. And the kind of learning experience that means I spend a sunny afternoon playing with inks on a beautiful balcony in Queensland – that’s the best kind of all. I don’t make a mess of everything on purpose … it just happens. 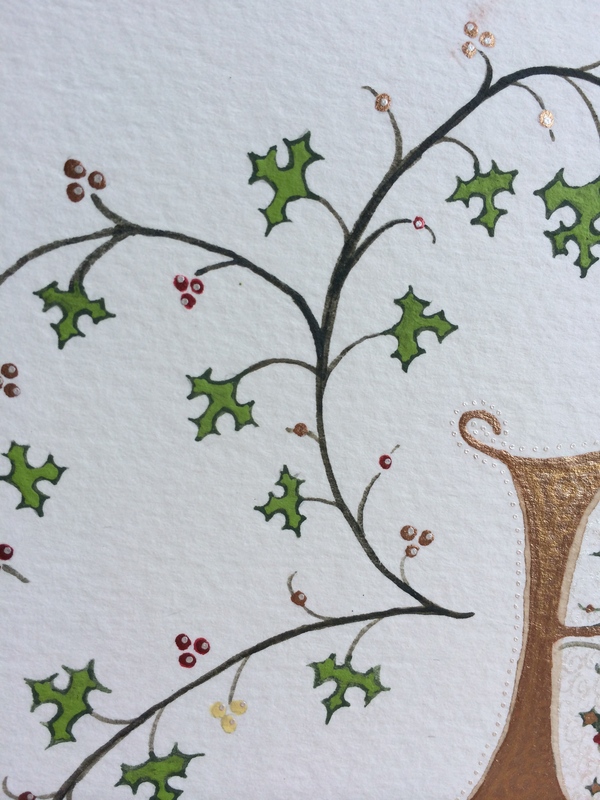 The click-through is to a lovely blogger who went to her first calligraphy class. She decided it wasn’t for her, but she had some very wise things to say about it, and that inspired my daily practice yesterday. In a world where instant gratification is increasingly the default, it is good to be reminded that some things can only be done well if you are willing to take the time, stop taking shortcuts, and slow down long enough to get them right. I think that’s what I like about calligraphy the most.